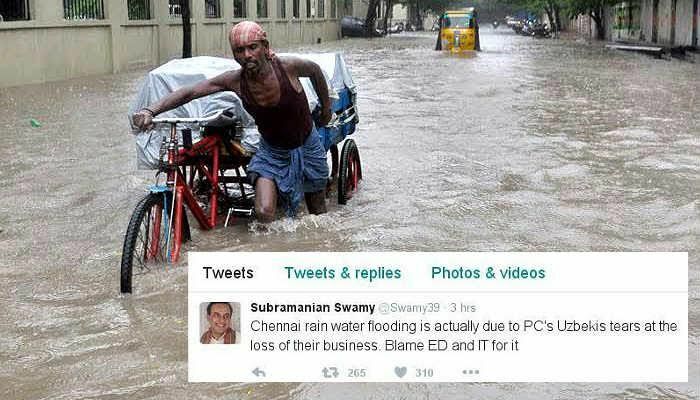 Even as social media displayed tremendous common sense and goodwill in dealing with the flood crisis in Chennai, BJP leader Subramanian Swamy used Twitter and the Chennai rains to target former finance minister P Chidamabaram. As thousands of people in Chennai are stranded without electricity and food due to water logging and heavy rains, Swamy's political joke is not only badly timed but also downright insensitive. The story behind Swamy's tweet. Officials from the Enforcement Directorate (ED) and Income Tax on Monday conducted searches at a premises in Tamil Nadu said to be linked to former Finance Minister P Chidambaram's son Karti. The raids were conducted purportedly in connection with the agencies' investigations into the Aircel-Maxis deal - a part of the probe into the 2G scam case. Reacting to the raids, P Chidambaram accused the government of malicious onslaught against his family. Swamy has always spoken about how Karti Chidambaram benefited from the Aircel-Maxis deal.